Chronic obstructive pulmonary disease (COPD) is a common lung disease. Having COPD makes it hard to breathe. Most people with COPD have a combination of both conditions. Smoking is the main cause of COPD. The more a person smokes, the more likely that person will develop COPD. But some people smoke for years and never get COPD. In rare cases, nonsmokers who lack a protein called alpha-1 antitrypsin can develop emphysema. Because the symptoms develop slowly, some people may not know that they have COPD. 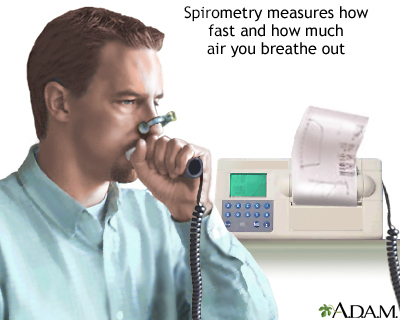 The best test for COPD is a lung function test called spirometry. This involves blowing out as hard as possible into a small machine that tests lung capacity. The results can be checked right away. Using a stethoscope to listen to the lungs can also be helpful. But sometimes, the lungs sound normal, even when a person has COPD. Imaging tests of the lungs, such as x-rays and CT scans may be ordered. 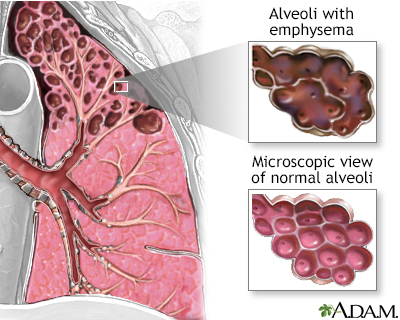 With an x-ray, the lungs may look normal, even when a person has COPD. A CT scan will usually show signs of COPD. Sometimes, a blood test called arterial blood gas may be done to measure the amounts of oxygen and carbon dioxide in the blood. There is no cure for COPD. But there are many things you can do to relieve symptoms and keep the disease from getting worse. If you smoke, now is the time to quit. This is the best way to slow lung damage. Your health care provider may prescribe antibiotics during symptom flare-ups, because an infection can make COPD worse. You may need oxygen therapy at home if you have a low level of oxygen in your blood. Pulmonary rehabilitation does not cure COPD. But it can teach you more about the disease, train you to breathe in a different way so you can stay active and feel better, and keeps you functioning at the highest level possible. You can do things every day to keep COPD from getting worse, protect your lungs, and stay healthy. Ask the provider or therapist how far to walk. Slowly increase how far you walk. Avoid talking if you get short of breath when you walk. Use pursed lip breathing when you breathe out, to empty your lungs before the next breath. Eat healthy foods, including fish, poultry, and lean meat, as well as fruits and vegetables. If it is hard to keep your weight up, talk to a provider or dietitian about eating foods with more calories. Surgery to remove parts of the diseased lung, which can help less-diseased parts work better in some people with emphysema. Lung transplant for a small number of very severe cases. You can ease the stress of illness by joining a support group. Sharing with others who have common experiences and problems can help you not feel alone. COPD is a long-term (chronic) illness. The disease will get worse more quickly if you do not stop smoking. If you have severe COPD, you will be short of breath with most activities. You may be admitted to the hospital more often. Talk with your provider about breathing machines and end-of-life care as the disease progresses. Go to the emergency room or call the local emergency number (such as 911) if you have a rapid increase in shortness of breath. Not smoking prevents most COPD. Ask your provider about quit-smoking programs. Medicines are also available to help you stop smoking. Criner GJ, Bourbeau J, Diekemper RL, et al. Prevention of acute exacerbations of COPD: American College of Chest Physicians and Canadian Thoracic Society guideline. Chest. 2015;147(4):894-942. PMID: 25321320 www.ncbi.nlm.nih.gov/pubmed/25321320. Global Initiative for Chronic Obstructive Lung Disease (GOLD) website. Global strategy for the diagnosis, management, and prevention of chronic obstructive pulmonary disease: 2018 report. goldcopd.org/wp-content/uploads/2017/11/GOLD-2018-v6.0-FINAL-revised-20-Nov_WMS.pdf. Accessed June 25, 2018. Han MK, Lazarus SC. COPD: clinical diagnosis and management. In: Broaddus VC, Mason RJ, Ernst JD, et al, eds. Murray and Nadel's Textbook of Respiratory Medicine. 6th ed. Philadelphia, PA: Elsevier Saunders; 2016:chap 44. National Institutes of Health, National Heart, Lung, and Blood Institute website. COPD National Action Plan. Bethesda, MD: National Institutes of Health; 2017. NIH publication 17-HL-8031. www.nhlbi.nih.gov/health-topics/education-and-awareness/COPD-national-action-plan. Allen J. Blaivas, DO, Division of Pulmonary, Critical Care, and Sleep Medicine, VA New Jersey Health Care System, Clinical Assistant Professor, Rutgers New Jersey Medical School, East Orange, NJ. Review provided by VeriMed Healthcare Network. Also reviewed by David Zieve, MD, MHA, Medical Director, Brenda Conaway, Editorial Director, and the A.D.A.M. Editorial team.